1928: Construction of Chrysler Building begins, further popularizing the Art Deco motifs on skyscrapers and other major construction. 1937: Golden Gate Bridge built in San Francisco. The Art Deco bridge is a landmark of modern architecture. 1939 to 1945: World War II: Most major construction halts while resources and labor are diverted to the war. 1947: Design of St.Louis Arch — Modern style architecture. 1950s: The end of World War II and the Baby Boom leads to an explosion in home building. The attached garage becomes a common feature in new homes. 1962: Seattle Space Needle completed — considered by some the launch of post—modern architecture. 1977: completion of World Trade Center in New York. The two towers highlight Post Modern architecture. In 2001 they will become a symbol for American grief and unity. Many believe Modernism in America began with Frank Lloyd Wright, whose Prairie style distilled the essences of form and function. In Europe, similar impulses toward simplification were taking place — beginning with Art Nouveau in the last decades of the 19th century and culminating in Art Deco, often considered the last true style in the age of decorative arts. Paralleling developing theories in all the creative arts, Modernism showcases abstract styles and simplified geometric forms. New materials and structural technologies allowed architects to create structures that had previously been impossible. Modern architecture is bold and looks to the future. Abundant and affordable selections of style, size, and finish give the modern homeowner more choices than ever before. Despite the advances, however, the influence of the past continues to provide the foundation from which modern ideas and buildings are built. The roots of history expressed in our modern landscape remind us that while change seems inevitable, we are connected to a tradition of creativity and innovation that draws our attention to the past as it points us toward the future. Art Deco The British historian Bevis Hillier popularized the term Art Deco, taken from the 1925 exposition, Internationale des Arts Decoratifs Industriels et Modernes (International of Industrial and Modern Decorative Arts), held in Paris. But the International Style Exhibition in 1932 at the Museum of Modern Art marks the coherent turning point for the modern styles. Art Deco architecture looked toward the future, rather than the past. New materials, such as Bakelite, steel, and aluminum were employed in building and hardware. Designers plated brass with nickel or chrome to create a vigorous and bright color palette. New types of electrical lighting, including neon, gave art deco buildings a futuristic allure. Art Deco uses bold vertical lines and stretched figures and forms - the distinctive sunrise and ziggurat motifs hint at the rush of progress that was to come. International Originating in Europe, the International style was brought to America by refugees escaping the unstable political and economic situation of Europe prior to World War II. The International style emphasizes new technologies and materials; it eliminated most decoration that was not utilitarian. The forms are geometric, and roofs were typically flat. Glass is used in unconventional ways, sometimes even rounding a corner. Colors are simple and tended toward white or grey, and materials are typically man-made, although wood is sometimes also used. Streamline Moderne The technology of flight and the distinctive look of the aerodynamic, gleaming airplane inspired the style known as Streamline Moderne. Metals are almost exclusively nickel or chrome, and hardware was given a smooth polished surface. Sleek, curving lines and cylindrical motifs make Streamline Moderne homes look as though, were they not nailed to their foundations, they might take off. Post-war Modern After World War II, the United States experienced an unprecedented housing boom. Familiar structures such as the manufactured home, rambler, split-level, and A-frame were built by the millions. New development projects used the burgeoning road system to connect the city centers to the expanding suburbs. These new houses were roomier and better constructed because of new building methods that featured the duplication of floor plans and the use of power tools. What modern homes lacked in individuality they made up for in affordability. 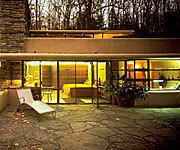 Most of these homes also offered a new space of growing importance to the post-war modern family: the attached garage. Spanish Revival During the mid -1900s the population of the American Southwest, particularly California, grew rapidly. As the need for homes grew, architects and homeowners took inspiration from the established regional traditions of Spanish Colonial and Mission architecture. Historic design elements such as red tile roofs, abode or stucco walls, and native landscaping are combined with modern elements to create homes that are both brightly lit and comfortable. Spanish Revival exteriors blend into their environment, yet their interiors are often warm, spacious, and informal. Postmodern Eclectic With a wealth of styles and inspirations to draw from, post-modern homes - those built after about 1975 - combine diverse elements to create a mixture of vintage and modern. Most new construction today falls into this category. Postmodern eclectic neighborhoods may feature a combination of Colonial, Federal, Victorian, Craftsman, and Modern elements within the same street - sometimes even the same house. 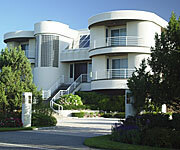 Despite their differences, most postmodern eclectic homes do have commonalities. Many feature open floor plans, high ceilings, an abundance of windows, light interiors and an emphasis on comfort rather than decoration. Exteriors may combine a variety of building materials such as brick, stone, adobe, wood, or aluminum siding. Interior walls are most often painted drywall, and roofs are usually asphalt or slate tiles. Modern Hardware Modern hardware features many innovations and adaptations. Chrome or nickel plating and the creation of techniques to chemically aged or powder-coat brass gives today's homeowner dozens of choices in finish and style. Modern composites such as stainless steel, aluminum, and PVD (a polymer coating) allow a further range of options. Almost all hardware is now cast or machine-stamped, although forged pieces are still very affordable. Since the early part of the century hardware has been increasingly standardized. Modern conversion door sets are designed to install easily in pre-drilled doors with standard backsets. Electrical switches conform to a limited number of configurations. Screw threading and size is limited so that even the local supermarket may provide a solution for weekend warriors doing home improvement. Yet standardization has not diminished the creative impulse — an enormous range of decorative styles, shapes, sizes and finishes is available, so that even the most meticulous of designers can find something to suit their needs.